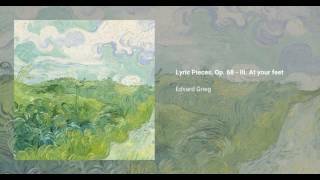 Edvard Grieg published his Lyric Pieces (Lyriske stykker) in ten volumes, starting in 1867 with Op. 12 and finishing in 1901 with Op. 71. The ninth volume, written in 1898, and published in 1899 (numbers 4 and 5 orchestrated that same year), consists of 6 pieces, named Matrosenes oppsang (Sailor's song), Bestemors menuet (Grandmother's minuet), For dine føtter (At your feet), Aften på højfjellet (Evening in the mountains), Bådnlåt (At the cradle), and Valse mélancolique (Melancholy waltz). The 10-book collection includes several of his best known pieces, such as Wedding Day at Troldhaugen (Bryllupsdag på Troldhaugen), To Spring (Til våren), March of the Trolls (Trolltog), and Butterfly (Sommerfugl). Grieg favored the theme he used on the very first piece of the set, Arietta. In fact he even usedf it to complete the piece by reworking it as a humorous waltz for the last piece of Op. 71. Even though the original publishing was made in several volumes, some editors treat the Lyric Pieces as a single set of works, numbering the 66 pieces as one single list.